This banana, pineapple, orange, strawberry smoothie is one of our favorite breakfast meals. Our whole family lines up because it is so delicious and filling; plus my husband and I are lazy about eating breakfast, so we get our fruits in without thinking twice about it. I often add kale, so that we are getting extra green leafy vegetables in our diet, too. This morning was just fruit. NOTE: We typically buy a lot of organic bananas, blue berries, strawberries, kale, as well as pineapple and kiwi - all at one time. I clean what needs it and let it ripen to perfection. I then peal, skin, cut into pieces (except the bananas) and freeze them in good storage containers. This way I don't have to use ice for certain recipes. We make smoothies and fruit ice cream so often that we go through these particular fruits very quickly. Put 2 cups of orange juice in the blender. Add 1 cup pineapple and 1 cup strawberries that are not frozen. Start on smoothie speed or low speed to get fruit mixed. Add the other cup of strawberries, 2 bananas broken in half. Turn blender on high and let the fruit mixture blend well. Your fruit smoothie can have the perfect thickness if your follow this recipe. This fruit smoothie recipe yields a full 6 cup blender. 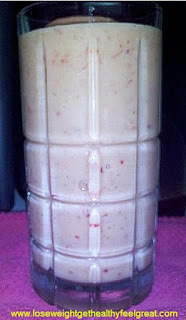 Total calories in this smoothie = 594 calories per blender. That is only 198 calories per serving for 3 people or 297 calories for 2 people. You can even add 2 tablespoons or ground flaxseed (80 calories total) in it for added nutrition and flavor. As I mentioned before, sometimes I add a bit of kale, too. Don't forget to check out more smoothie recipes on the Healthy Food Recipes page!